For the past couple of weeks I've tried out a number of different Toca Boca apps with our Pre-Kindergarten students and I've found all of them to be good for students to use in pairs or in small groups. 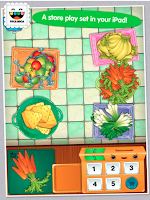 This app is for two students to play with together - one is the shop keeper and one is the customer. First the shop keeper has to set up the shop - the student chooses 5 items to be on sale in the baskets. The customer decides what he or she wants to buy and takes it to the cash desk. The shop keeper then has to decide on the price of the shopping. There's a purse with coins that the customer has to put into the till, and once the purchase is rung up the customer can put the item into a basket. Once the money has been spent the till prints out a receipt and the game is over. Students can then swap and take turns in the various roles. This game was easy for the students to learn and encouraged them to talk together about the items to be purchased and the prices. Paying for the goods reinforces counting up to 5. 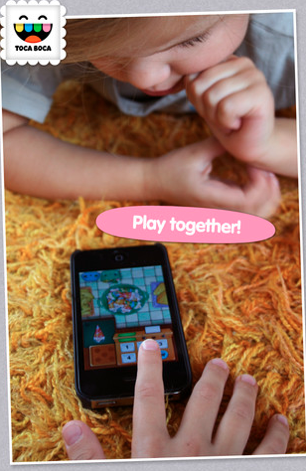 There's an iTouch version of this game too, which I've tried with Pre-School students. They also seemed to enjoy playing the game. I demonstrated it first using the iPad and then students were able to work in pairs using the iTouches. This app is aimed at children aged 4 and up. This was my favorite app of the 4 tested as I used this with 4 students at a time and had them talk to each other about what they wanted to eat and drink at a tea party. There are a variety of cakes and drinks to choose from. I had one student host the party and the other students were the visitors to the tea party. For this game I wanted students to be able to practice asking "What would you like to eat/drink?" and for them to be able to reply and to say please and thank you. In comparison to Toca Store, I noticed the students talking a lot more to each other while they were playing. Children can eat the food and drink and student hosting the party can fill up the cups and glasses and give out more cakes. If students knock over their drinks they have to mop up the spills and at the end of the game, after 4 rounds of cakes and drinks, the plates, cups and glasses have to be washed up. This would also be an ideal imaginative game for a child to play alone, with cuddly toys as the various guests at the tea party. I introduced this app to Pre-Kindergarten students this week. 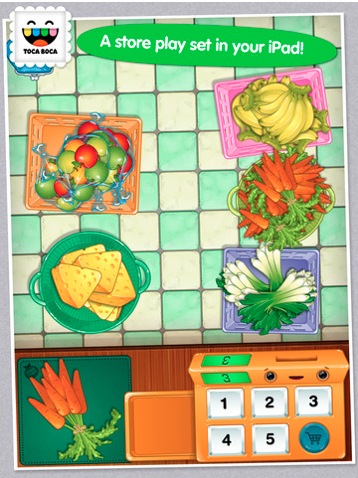 Neither Toca House nor Toca Kitchen involve the same level of interaction between students as Toca Store and Toca Tea Party, but I tried to have students use these apps in groups of 4s too. Toca House has various rooms with household tasks that need to be done such as lighting the fire, washing and ironing clothes, cleaning up, washing dishes and mowing the lawn. I had the students take turns in choosing which room to work in and which task he or she wanted to do. There's also a section for sorting (leaves, flowers, letters). In total there are 19 different activities to try out, and the game automatically finishes after 10 of these activities have been completed. I thought this game was the simplest of the 4 and would like to try it out with Pre-School students to see if they enjoy playing this too as it is aimed at children aged between 2 and 6. 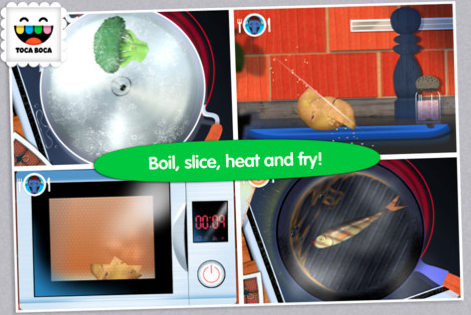 Toca Kitchen is where students can "cook" meals for 4 different characters. They select the food from the fridge, decide how to cook and serve it, and see if the characters want to eat it. 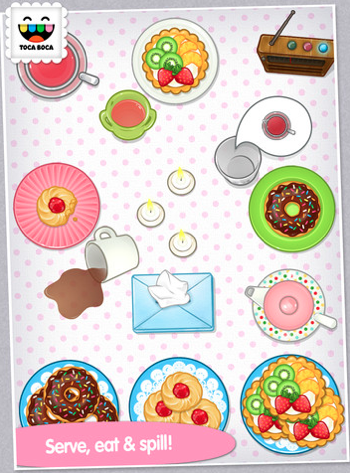 I thought Toca Kitchen was really well done and gave the feeling of being in a kitchen. The students also had fun working out what the various characters wanted to eat. This one was an interesting game because I noticed that students really got the impression that the food was cooking - in fact students who played this game actually got out play cups and plates and put them on the table beside them while they were using it. I heard a lot of discussion about which characters/animals liked which food and students were great at giving each other suggestions of different ways to prepare the food and there was a lot of problem solving about the best way to cook food so that the different characters would enjoy eating it. This app is aimed at children aged 4 and over. Thanks for a great blogpost. Glad you and your little testers seem to like our digital toys!